The property at 5 Shipway Road is on the market for $1,695,000. The quiet seaside neighborhood in the Noroton Bay Association is every bit what a coastal New England community should be. After passing through the welcoming pillars of Noroton Bay, visitors are transported into a special waterfront community with its own beach, pier and summer snack bar. Known for communitywide events, impromptu get-togethers and streets filled with beachgoers and golf carts heading to the shore on warm Friday afternoons, Noroton Bay is a tight-knit neighborhood. Quietly sited on Shipway Road, a Cape faced with Nantucket shingle-style siding and pale yellow shutters with a whale cutout motif offers an idyllic spot to call home. Completely renovated by the current owners, the house has been tastefully designed inside and out with a casual coastal vibe. 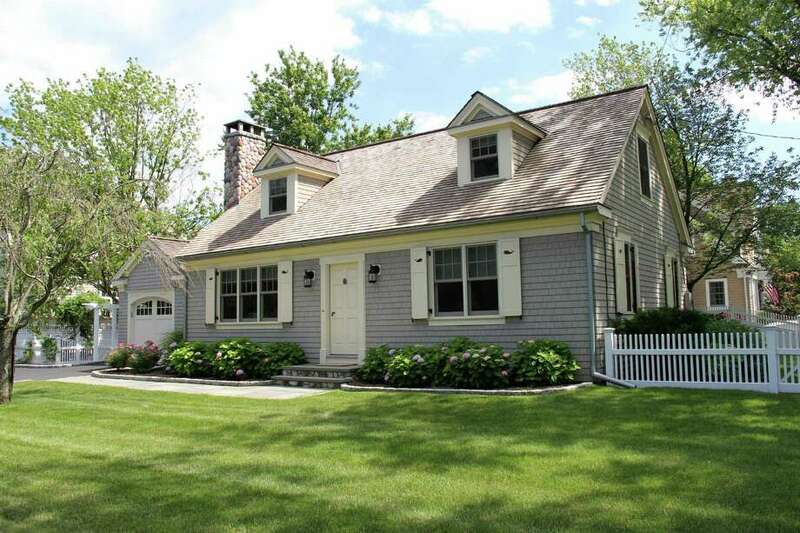 With a cedar roof, white picket fence and arbor gate and a resurfaced stone chimney, the home is charming. On the inside, with a modest 1,700 square feet of living space, every detail has been cared for. A custom mudroom is wrapped in classic wainscoting with built-in cubbies housing Nantucket-style baskets and a window bench for quick shoe changes. The mudroom doubles as a laundry room. The room has a built-in platform for the washer and dryer, with added built-in cubbies underneath for storing cleaning supplies and linens. The Christopher Peacock-designed kitchen has been tastefully designed with timeless materials to be beautiful and functional. Bright white cabinetry has been outfitted with walnut interiors for custom organizational storage, while upper cabinets are faced in glass for displaying dishes, glassware and other items. The cabinets feature custom ship-inspired latch hardware. The kitchen features leather-finished granite countertops, a hand-cut subway tile backsplash and a custom chalkboard-paneled Sub-Zero refrigerator. Appliances include a French La Cornue gas range with electric ovens, Miele dishwasher and Sub-Zero wine refrigerator. The kitchen opens into a lovely breakfast room with sliders accessing the backyard enclosed with a white picket fence. Unusual for a Cape, the floor plan allows for a formal living room and a family room, offering plenty of room for entertaining company. The formal living room features a remote-controlled gas fireplace with nautically inspired mantel set against a custom paneled wall treatment. The first floor also has a guest bedroom with thoughtfully designed storage features and full bath featuring marble basket weave floors, a lacquered beadboard ceiling and shower with a Cararra marble subway tile. On the second floor, there are two additional guest bedrooms, both with custom storage designs and plenty of natural light. The master bedroom features two closets, a built-in dresser, built-in desk area and a pretty porthole-style window. The three second-floor bedrooms share a full bath with a Cararra marble vanity, statuary marble step-in shower and wainscoting painted in a sparkling high gloss white. Even the one-car attached garage features Nantucket-style beadboard. "This is truly a `Do you have a cup of sugar?' kind of neighborhood," said Patty Reis, a real estate agent with Halstead Property. Contact Reis at 203-979-0150 or email her at preis@halstead.com.